I was born in 1952 and received my education at the Institut Supérieur des Beaux Arts St. Luc in Liège, Belgium. My career started in 1977 when I received the Prize Philippe d’Arschot. Besides many exhibitions in Europe, the U.S. and Canada my work has been exhibited at international art fairs by international art dealers and is present in national and international museums, corporate companies, private collections and at the Belgian Court. In recent years, after my career as a painter and etcher, I concentrate on the creation of bronze sculptures. I like the new challenge of working in three dimensions. Each painting of Méan, far from depicting a fleeting moment, tells a long story. Yet upon closer inspection one will find a lot of little details on these large canvases: letters (‘even if they do not contain a coded message,’ the artist explains) and small figures. They represent a rift with his abstract art, which he now sees as only a preliminary phase to his present work as sculptor. ‘I dislike repetitions. In my sculpture I take pleasure in doing exactly the opposite of what I do in my paintings. In my sculptures I use human, figurative forms, while in my paintings I primarily represent nature to express ideas like time, poetry, philosophy.’ Moreover, while the paintings clearly want to be light and airy, the sculptures in bronze, steel and stone seek to be sombre and robust. Earthly so to speak. Francis Méan dreams of a world that is more free and crazy, more poetic and artistic, with less outward appearance, where people take themselves a little less serious. A lifestyle that Francis Méan has internalized himself. Pablo Chimienti in Le Quotidien, Luxembourg. I want to show that in a chaotic world humans are still able to think, to amuse and enjoy themselves and to amuse others. My paintings are optimistic in tone and invite contemplation of the meaning of life and the future. As a Christian, to paraphrase Jacques Ellul, I describe a world without escape or solution, but with the conviction that God will go with those who seek him. 1. 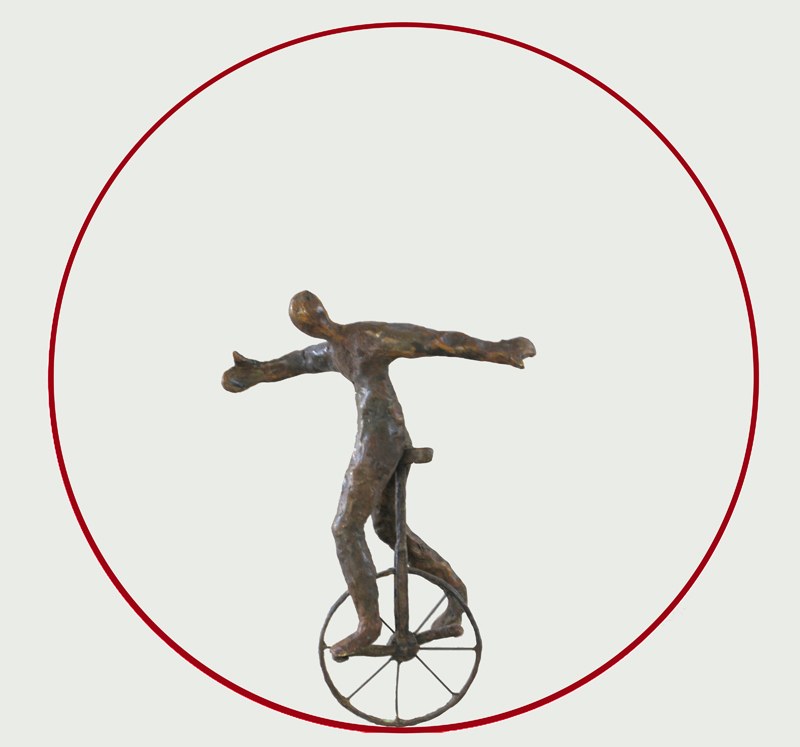 The equilibrist, sculpture in bronze and blue stone. 2. 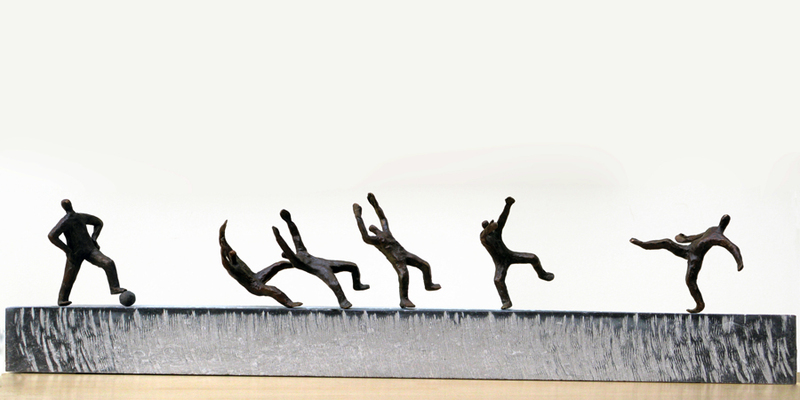 The man who shoots faster than his shadow, sculpture in bronze and blue stone. 3. Le maitre de l’illusion, sculpture in bronze, blue stone and brass. 4. 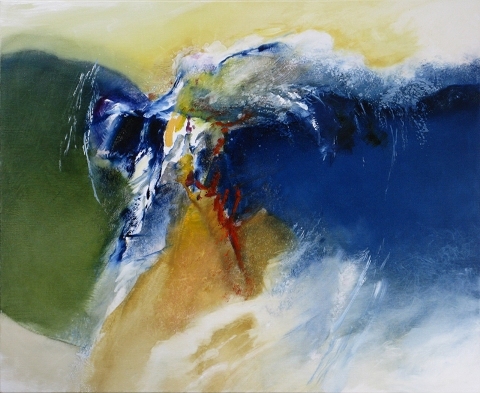 Les hautes falaises, oil paint on canvas, 2 x 120 x 100 cm. 5. La mer des joncs, oil paint on canvas, 90 x 110 cm. The decoration of the Sheraton (presently Hilton) Hotel in Malmö, Sweden. 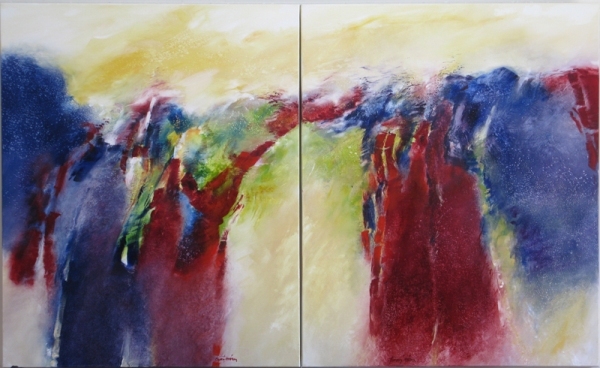 A large triptych in the ING headquarters in Antwerp, Belgium. A broadcast by NCRV TV, the Netherlands, about my work and ideas in the series « Het Verschil ». An exhibition on the occasion of the 3000th anniversary of Jerusalem at the invitation of the cultural centre of the embassy of Israel in Brussels, Belgium. Verlag Lamers in Dortmund, Germany, published several volumes with my work, each one dedicated to a special theme like creation, the seasons, the elements, and the 10 commandments. Bible prints (illustrations) for Plantijn publishing company in Antwerp, Belgium. The illustration of the Fables of Jean de la Fontaine for a Swedish publisher.